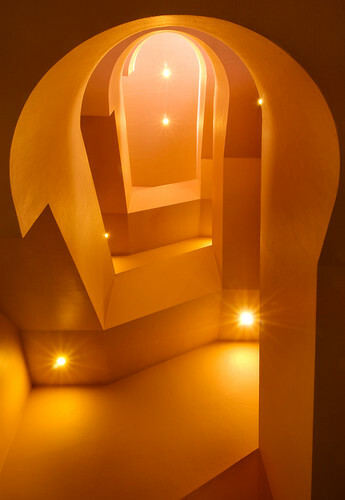 Wright Stairs, photo by Harold Davis. View this image larger. This is a photo taken looking straight up one of the smaller, back staircases at the Marin Center, designed by Frank Lloyd Wright. The results are almost abstract: I don’t think one is quite sure what one is looking at. There’s very little Photoshop work here, just a bit of adjustment to compensate for the mixed-color-temperature light environment. Related images: Resistance to Spirals Is Futile, Endless Stair. Big Dipper, photo by Harold Davis. View this image larger. 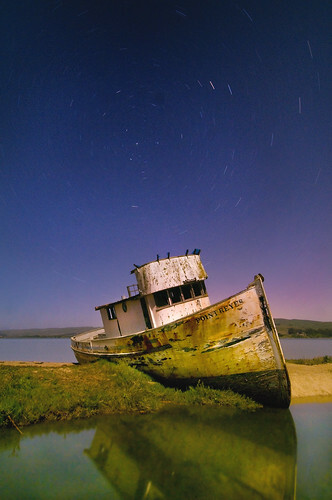 While shooting the Star Trawler and Pole Star sequence, I noticed that the old, wrecked trawler Point Reyes could be shot facing due north so that Polaris would be centered within a circle of moving stars. I decided to come back to the spot on a moonless night for some really long shots that would capture circular star trails around the stationary Polaris. Driving into the sunset past Samuel Taylor State Park I headed into a fog bank, and when I got to Inverness it was foggy, windy, and cold. I almost didn’t get out of the car. But I did, wandering down to the boat without my camera. As I looked up, I watched the sky clear. Back at the car, I stripped and put on my woolen long underwear. It was going to be a long, cold vigil. This was a warm-up test shot at three minutes (the 40 minute exposures came later). I like the way the Big Dipper is so clear and obvious in this photo. For the curious, I supplemented the lighting on the boat with some discrete light painting with my head lamp. The trick, I find, is to keep the bursts of light short and constantly in motion. Falling in Love on White, photo by Harold Davis. View this image larger. This is the Papaver rhoeas ‘Falling in Love’ that I photographed on a black background. The version here gives me the advantage of a “twofer”: I created the white-background version of the photo in Photoshop by inverting the Luminosity channel (in LAB color mode), then copying the orginal flower back on top of itself, and masking out the black. A few tweaks followed, but that is the general idea, and it is pretty simple to do. Which version do you like better? Falling in Love, photo by Harold Davis. View this image larger. 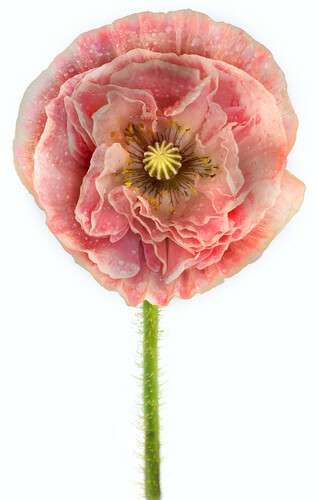 This is a photo of a Papaver rhoeas ‘Falling in Love,’ a double variety of Papaver rhoeas I got from Annie’s Annuals. 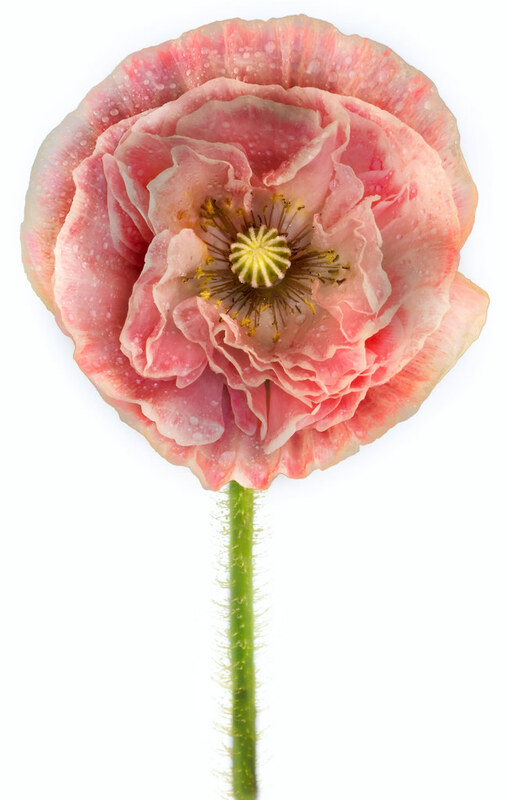 I cut a flower off the profusion of these poppies in our garden, and photographed this flower indoors. I put the flower in a glass flute to keep it upright, and placed the flute on a black velvet background. The background rested on a board and rod placed between two chairs. I positioned the flower so sunlight was striking it from behind and to one side. Then I used a large piece of soft gauze to soften the sunlight. In Photoshop, I combined three exposures at times from 1/2 a second to 2.5 seconds to capture the full dynmaic range of the light falling on the delicate pink petals. Related story: Here are some shots of the Dawn Chorus variety of Papaver rhoeas. Looking Down, photo by Harold Davis. View this image larger. 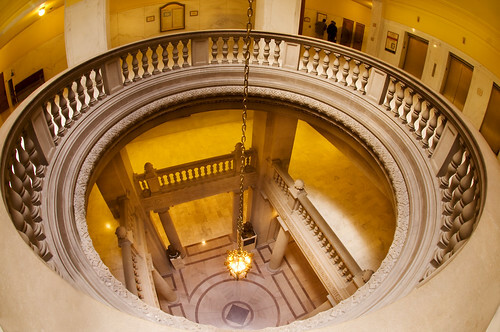 I took the original version of this photo (you can see it below) from the top of a rotunda in San Francisco City Hall. You can see a couple of people reading notices by a courtroom door, and the faint shadow of people in motion walking the corridors, rendered wraith-like by the long three-second exposure (selected so I could get plenty of depth of field). 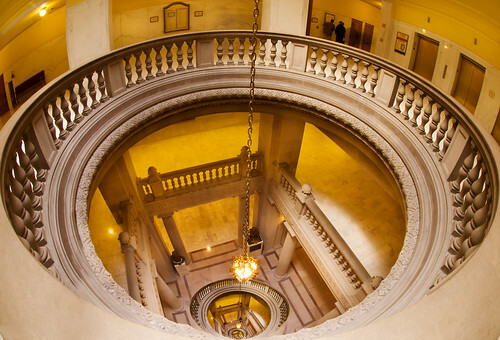 The circular opening in the photo was actually pretty narrow, and the railing was high. The problem for me was getting my tripod in position over this balustrade. Even so, some tripod shadow and a tripod leg ended up in the capture, and I had to Photoshop them out. With a decent rotunda view in hand, I pasted in four successively smaller (each copy was 20% of the size of the previous version) copies of the orginal image, to create a composite with the illusion of endless depth. This is the same technique I used in Endless Stairs and World without End. Red Flowering Dogwood, photo by Harold Davis. View this image larger. Phyllis and I celebrated our wedding anniversary last week. Sixteen years, three kids and one more on the way, it all seems like forever and no time at all. I’m so lucky to have a real life partner. My parents sent flowers as did Phyllis’s mom. This red flowering dogwood blossom is from a branch in one of these bouquets. 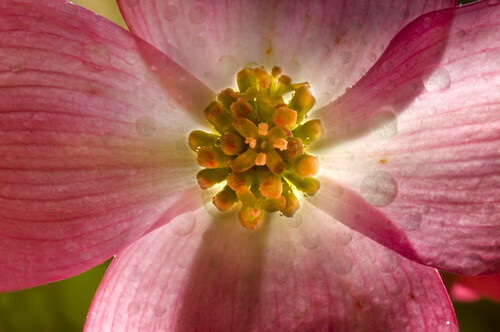 I photographed the blossom in the morning like of our breakfast nook using a macro lens and extension tube setup. The water drops are judiciously applied, and come from my professional high output sprayer. This final version combines different exposures and three different stacked focus points, for an image that is (depending upon the definition of the term) HDR as well as High Focal Range (HFR). Campsite #4, photo by Harold Davis. View this image larger. I spent a night last week camping on Angel Island. Smack dab in the middle of San Francisco Bay, wild in the midst of civilization, I had a great time. You can only reach Angel Island by ferry, and after the last ferry left I had the place pretty much to myself. I climbed Mount Livermore, and then settled down at my camp. Perched on the southwest corner of the island, I had drop-dead views of Alcatraz, downtown San Francisco, and the Golden Gate. The show started at sunset, and did not stop. More photos will follow. I took this one a little after midnight. There was a huge old Eucalytus tree stump at my campsite. 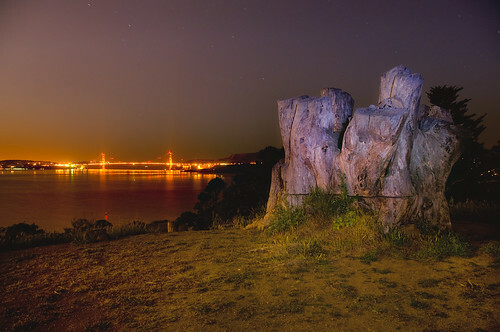 I exposed for the Golden Gate Bridge, and lit the stump (which was in deep shadows) during the exposure by “painting” with light, using my headlamp. Related stories: Alone in the City; Gerbode Valley. Daffodil, photo by Harold Davis. View this image larger. If you’ve ever looked closely at a daffodil like this beautiful specimen, you’ll know that within the outer yellow petals is an orange “trumpet”. The trumpet itself contains the reproductive parts of the flower: ovaries, pistil, and the stigma, style, and anthers shown in this photo. You’ll know, from having observed the daffodil, that these reproductive parts are really, really tiny. So tiny that when I photographed this flower indoors (to control wind) backlit with the bright light of the morning sun in our breakfast nook, I found I could not get both the style (which sticks out a bit) and the anthers (the things covered with pollen) in focus. The solution is to extend the field of focus by taking multiple photographs, each with a different point of focus. Provided you use the same aperture in each exposure, it can be possible to combine the two images as layers in Photoshop, thus extending the field of focus. 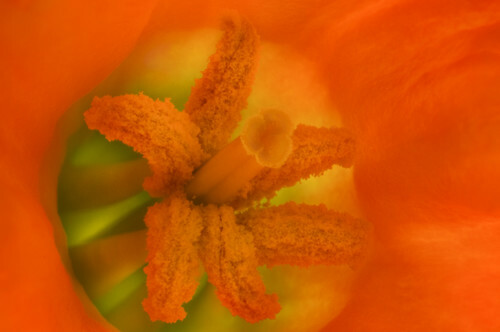 In this case, I took two captures, one focused on the style and one focused on the anthers. Monochrome Shore, photo by Harold Davis. View this image larger. I’ve been thinking a good bit lately about making black and white prints from certain of my digital images. Actually, since the final output would be using my digital printer, printing via offset, or display on a color monitor, what I’m really doing is to use the RGB (or CMYK) color notation to create a simulation of a black and white image. So this is an intentionally retro endeavor. Worth noting: quality vintage black and white prints were not actually “black” and white, but toned to create a rich (but monochromatic) look. 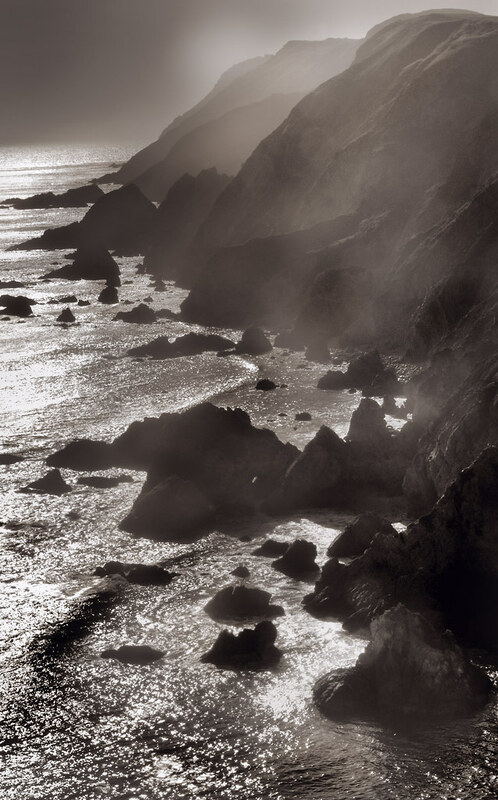 I took this photo from a position some way off the Chimney Rock Trail in Point Reyes, look west at the setting sun and the rugged shore of the end of the Point Reyes peninsula. My intention when I took the photo was to convert it to monochrome, because there were hardly any colors anyhow. The shoreline seemed backlit to me, and I figured, well you can get a glamour backlit black and white of a model, why not a landscape? Taking the photo took a fraction of a second, but converting this image took much longer. First I processed it from the RAW as I would a normal color image, using several different RAW “exposures” in combination. Next, I tweaked each color channel used Color Channel adjustment layers with monochromatic check. I weaked the whole confection a bit, then added a few adjustments in LAB color and a tritone version of the original on top of my (by now massive) layer stack. Not to oversimplify, I used a variety of blending modes, masks, and adjustment layers. If there is a moral to this, it’s that the key word is “simulate.” To get the “black & white” results I wanted, I needed to alter the color structure of the image, creating an entirely new look in the process. Well, honestly, that’s what I normally do with my photos much of the time. Related story: Nautilus in Black and White. Scalloped, photo by Harold Davis. View this image larger. I stood on the bluffs high above Drakes Beach just after the sun had dipped below the horizon. The high bluffs shadowed the beach below, while the light of sunset still reflected from the incoming surf. I shot a sequence of images at various shutter speeds. If you are curious, the faster shutter speeds came out better than the slower ones at the same EV value. Across the board, I intentionally underexposed by about two f-stops (or by a factor of four) to make the beach go even darker while still picking up the colors in the water. Back at home, when Phyllis and I looked at the sequence in Adobe Bridge, the thumbnail looked to us like a scalloped sea shell on a black background. I processed the photo in Photoshop to emphasize this effect. Related stories: Wave Tangent, Patterns of Design. Country Road, photo by Harold Davis. View this image larger. The verdant emptiness of the Point Reyes peninsula is achingly beautiful just after sunset. On a recent weekday, there was no one around. On my way back from the Point Reyes lighthouse and Chimney Rock, I paused on a rise beside the road. The fresh air was redolent of the ocean, with a tang of dairy farm and fresh grass. I set up my tripod near the road, with the assumption that no car was going to careen over the rise into me. 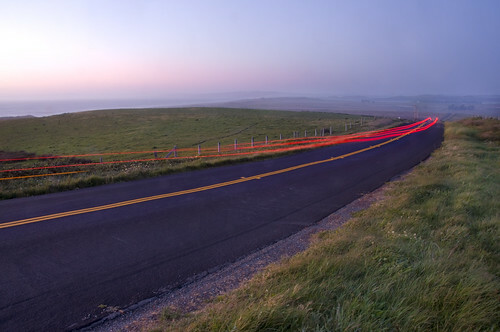 Then a lone car came over the hill, went wide around me, and I pressed the shutter for this fifteen second exposure. Next, it was on to Inverness to photograph the star trawler. Pole Star, photo by Harold Davis. View this image larger. 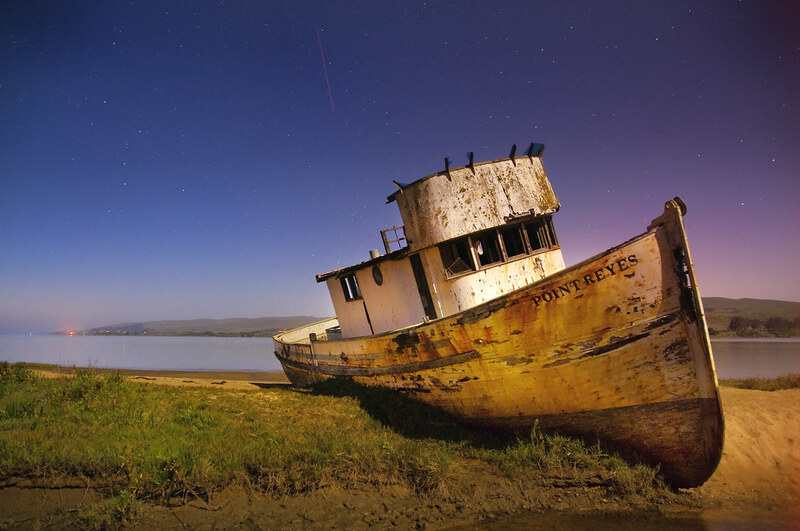 This is the last of a sequence of twelve photos of the wrecked Point Reyes trawler near Inverness. I took these photos the other night over the course of a couple of hours. The sequence started with The Long and the Short, and included Star Trawler. 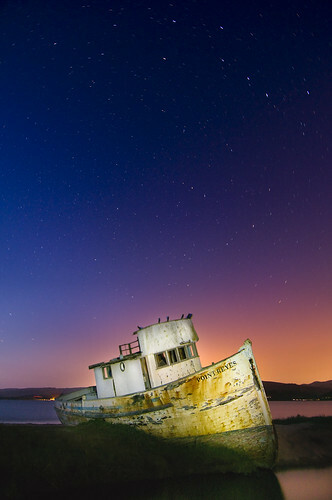 Like Star Trawler, this last capture in the series is a 1,204 second (20 minute) exposure. As I was taking this photo, I was interested in the reflection of the boat in the water. I’ll admit I was pretty bored with all the waiting around during the long exposures and the in-camera noise processing, so I augmented the reflection with a little discreet light painting on the hull with my headlamp. I also angled my camera so that it was facing due north and the Pole Star. The Pole Star, also called Polaris or the North Star, is almost stationary in this photo while all the other stars trail around it. This is because the Pole Star lies nearly in a direct line with the axis of the Earth’s rotation “above” the North Pole. It has been rudimentary night-time navigation for thousands of years in the nothern hemisphere to determine north using the Pole Star (and is still useful if you are lost in the wilderness at night without a GPS or compass). To determine north, first find the Big Dipper. Next, locate the “cup” part of the dipper so you can draw a mental line extending from the star Merak and extending beyond the star Dubhe (you’ll find a diagram in the Wikipedia article). The extended line will point at the bright Pole Star (it’s about five times as far from Dubhe as Merak and Dubhe are apart). Draw a line from the Pole Star to the earth, and you’ve fairly accurately found north. This explains why I was excited when I spotted the Big Dipper pointing to the Pole Star directly above the wreck of the Point Reyes. I was hoping to capture the stars whirling around the single still point of Polaris above the boat. Star Trawler 2, photo by Harold Davis. View this image larger. This is my first, and shortest, exposure of the Point Reyes boat the other night. As I explained in my original story about the star trawler, I was surprised to find the apparently monchromatic moonlight producing such vibrant colors. The longer exposure was intended to produce star trails, but I like the effect here too: of stars more the way we see them. The pair of photos illustrates a spread of aperture-shutter speed combinations, both at essentially the same exposure value: from 1,204 seconds at f/22 at the long end to 30 seconds at f/3.5 at the short end. (“Long” and “short” refer to time.) Since depth of field is not an issue in these photos, the contrast is a good illustration of the differing way exposure time treats objects in motion (the stars). 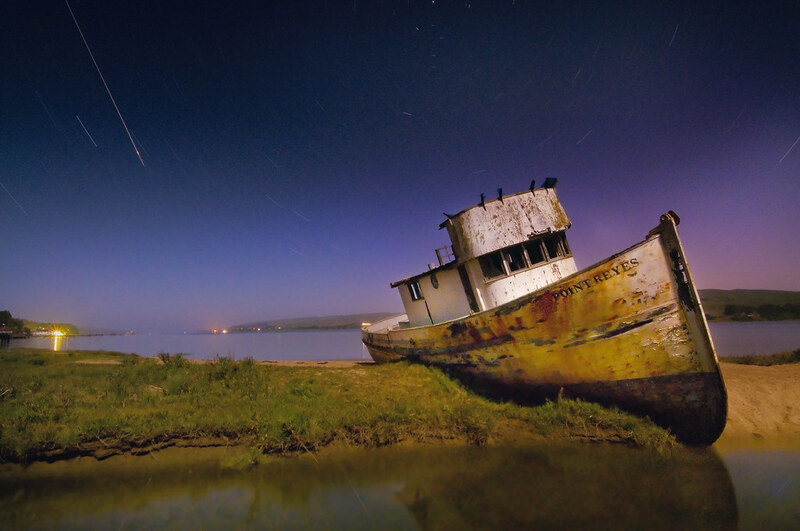 Star Trawler 1, photo by Harold Davis. View this image larger. This is a 1,204 second (or about twenty minute) exposure of the wrecked fishing trawler Point Reyes. I’ve photographed this boat before, but never at night. There was a bright moon in the sky, and as I walked across the mud flats behind the Inverness General Store, my fear was that all that moonlight would detract from the starlight. As I set up my tripod, polka music came faintly from the Czech restaurant in Inverness. Vladimir’s, it seems is still run by 78-year-old Vlad, and according to this review sometimes features live music from the old country, which must have been what I was hearing. Somehow, the music seemed to fit the slightly sad scene of the wrecked boat forever grounded on the mudbank. As I began running test exposures, it became clear from my review in the LCD that my fears that moonlight would render colors monotonic were misplaced. It’s true that the stars were not as bright in the sky as they would have been on a moonless night. But the moonlight brightly lit the dark mass of the trawler (helped along in this exposure, I confess, with a little judicious light painting with my head lamp). The moonlight also created the reflections in the water in the foreground. If you look closely, you’ll even see reflected star trails. And the astounding thing was that to my eye the world lit by moonlight was close to monochromatic, but the sensor picked up things with the vivid colors you see here. For this long exposure, I stopped the lens down to f/22, with the idea of picking up as much star motion as I could. Clivia, photo by Harold Davis. View this image larger. Clivia, a lily-like flower originally from southern Africa, grow on the shaded side of our house with very little intervention from me. These are slow growers, but spectacular, and unstoppable once established. I love them, but they’re tough to photograph in the deep shade, with their tendency to move in the slightest wind. So the obvious move was to cut a nice stem of clivia, put it in a vase, and photograph indoors. 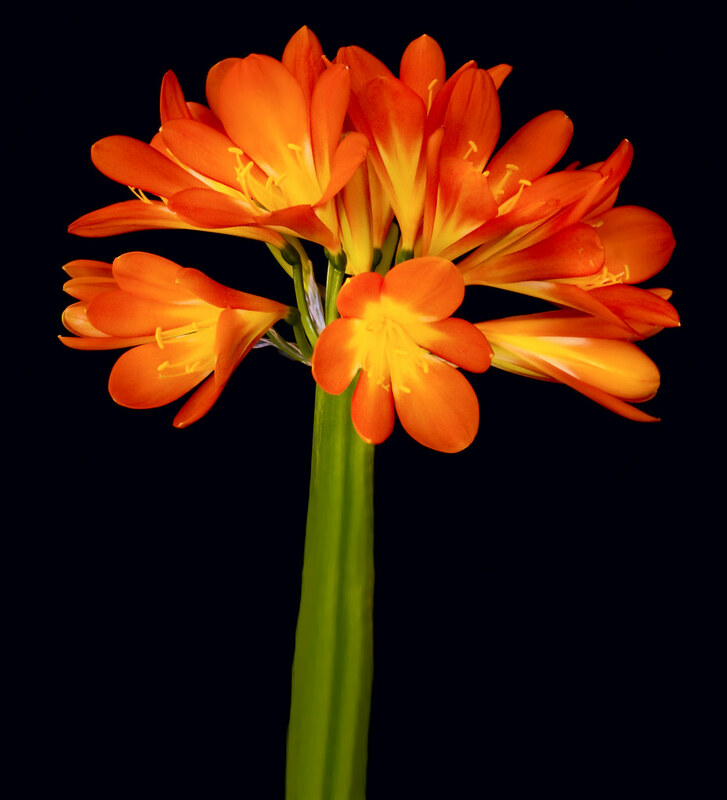 The clivia is shown here stopped down to f/32 for a high depth-of-field image. I put the stem in the vase on a black background using sun light for illumination. Like the anemone I photographed the other day, the final image represents several initial exposures at different shutter speeds (see the technical data below). So, I assembled the flowers on the clivia stem from two exposures, one lighter and one darker. Looking at the results, I saw I needed more construction. I was looking at a horizontal, and the image needed to be vertical. 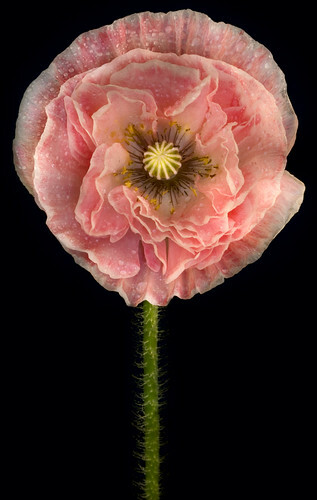 This switch was a matter of cropping in on the flower, extending the canvas downward using a black background color, and adding a layer to extend a cloned version of the stem. Related images: Asiatic Lily Bouquet, Sunflower.